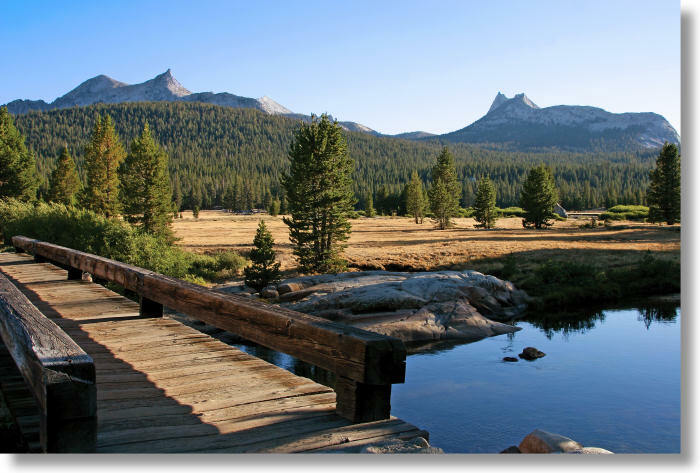 Tuolumne Meadows was the first ever inductee into the International Meadow Hall of Fame.1 It's ringed by picturesque peaks, bisected by a meandering river, lousy with wildflowers and grazing deer, and dotted with curiosities like a soda springs and the world's most scenic sewage treatment pond. It's at an elevation of a little over 8,000 feet (2,400 meters), so your lungs will get a pleasant workout just by being there. There's a little shop across the road selling ice cream. You just can't go wrong with Tuolumne Meadows. Like this photo? You can download a larger version to use as your desktop wallpaper. 1 Of course it exists! I should know; I invented it myself.